Sizes Available: 2.2 lbs, 6.6 lbs, 15 lbs. 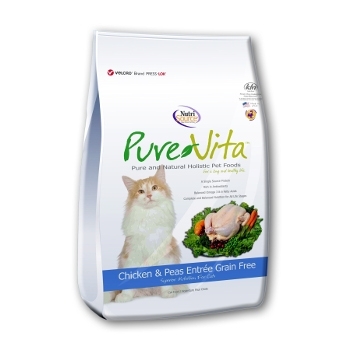 PureVita™ Brand Grain Free Chicken & Peas Entrée combines the delicious taste of chicken with a variety of nutritious fruits and vegetables. And because it is made by NutriSource®, you can be sure it has our exclusive "Good 4 Life" system and the finest quality ingredients available for your cat or kitten.